If you are new to Square Foot Gardening and are wondering how to start gardening, you have come to the right place. Why not start with the easiest, simplest, most productive method known? Read below and if you are already a SFG, study all these advantages and pass them on to others. This book has turned the Gardening World upside down. Mel Bartholomew, a retired engineer, invented a better way to garden. Backyard Gardening will never be the same again. Two Million Book Buyers Can’t Be Wrong! If you don't grab a copy of this book, you are doing yourself a tremendous disservice. Shorten your growth curve and just buy the book. You won't regret it. It works! Thanks for the comment. I’m really proud of the All New book and your comments were very encouraging. Be well and please send me any videos or pictures of your garden if you have one! Do you have a Kindle version or a pdf of SFG? I lent it to my sister and she’s since sent it to a friend. I know I’ll never get it back , but rather than buy another copy that will get “loaned out,” I’d rather have an ecopy I can have with me everywhere! Silly me! Of course you have a Kindle version; just saw it on Amazon. THANKS for always thinking ahead. I greatly appreciate your letter and I’m hoping that it will encourage others to buy the book. The ALL NEW book and system has now sold over a million copies in just five years. I hope you’ll be able to spread the word in your neighborhood and encourage others to try it out with you. You might also want to order the Introduction to SFG video. It’s 36 minutes long and takes you through an actual class where you’ll learn all the details. Most people learn more if they’re watching versus reading, but both are available. Thanks again for your great letter and best wishes. P.S. – Why not take a few photographs of your garden and show others how easy it can be! Keep it small, and if you need any supplies we have everything you’d need at your website at the SFG Store. When you buy from that site, all proceeds go to help our educational and humanitarian projects around the world. We just recently purchased your book and I’ve been really enjoying it even though I’m not yet far into it. Before I married I was in the Air Force and my degree is in civil engineering so I really appreciate your systematic and efficient approach to gardening. Now I am a stay at home mother of five (oldest is 5) and so I don’t have the time to attempt to garden with methods that require a great deal of time and resources. Although it is too late to apply your entire system this year as we are just doing standard raised beds and have already spent our budget, I look forward to implementing your ideas in the future. I can tell that this is the method that I’ve been looking for. Thank you for a very interesting letter and it’s great to have another civil engineer aboard. Now, if this is the method that you’ve been looking for, let’s get you started right now. You didn’t tell me what state you’re from, but let me know and if you’ve got raised beds, describe them to me and let’s see if we can’t get you going. 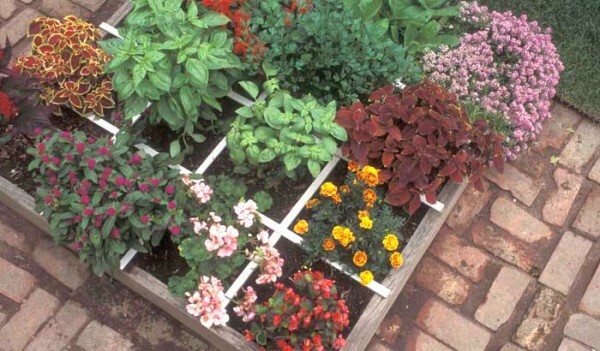 All you need is a grid and of course, it would be nice to have Mel’s Mix, but maybe we can convert some of your raised beds into a true Square Foot Garden with the weed fabric on the bottom and then six inches of Mel’s Mix, and then the grid right on top. You can order our grids. They’re very inexpensive right on our website. Here’s a link. If you can’t afford those this year I’ll even tell you how to build your own at almost nothing. Next thing that interested me, Paula, was you’ve got five children. And the 5-year-old is ready to start gardening, I’ll bet. You know, we build a 3′ x 3′, same way, 6″ of Mel’s Mix and divide that up with a grid, and you’ve got 9 square feet. And each child can have either their own box or their own square foot. I also did something for children way back when I had my TV show on PBS. I used my granddaughter for that. We built a 3′ x 3′, put it on the patio, had a plywood bottom, and then filled it with play sand. Well, that was her sandbox to play in and she happily did that while the rest of the family was gardening right in the same patio in their Square Foot Garden boxes. Well, you know what happened pretty soon. She kept saying when can I get my own Square Foot Garden? She pronounced it kind of funny. She was probably about the age of your 5-year-old. Well, we just scooped out the sand and filled it with Mel’s Mix. We’d already put some drainage holes in the plywood bottom. We were able to move it to a little different location, and she could now have her own Square Foot Garden. She couldn’t sit in it like she did her sandbox. That took a little bit. She wanted to sit in that middle square foot and then work around her, but we finally convinced her that you have to reach in, and since she couldn’t reach that far, we let Mommy or Daddy have the center square and then she had all the outer ones. She could reach in from all the way around the box. Worked out great. Think about that. Maybe we can still convert your beds to Square Foot Gardening. If not, you know, you can use scrap lumber and it doesn’t cost anything, and you can build a couple of boxes maybe close to the back door. That’s where we think they’re the best location for Square Foot Gardening. That way you see it more often, you tend it, it’s more attractive, you’ll harvest more and it just adds to a nice feeling every time you come out or go in your back door. Well, I hope that gives you some ideas, so get reading and get halfway through that book, and then let’s start talking about how we can get your gardening this year. Thanks again for your letter. It was great reading it. I am so excited about this book! I just bought it and I’m already half-way through it. I’m disciplining myself to read it all before getting started on my first garden! I am 21 years old and in college but I’ve been interested in growing vegetables for a long time. I love the earth and it seems like a lot of people are going back to it. Unfortunately, between two part-time jobs and a full load of schoolwork, time and money (why do you think I work two jobs?) are scarce. Likewise, my peers are more interested in the world behind their phone screens than they are in the practice that has sustained people for thousands of years! I have a quick question for you, Mr. Bartholomew… I live in far West Texas and we have a lot of caliche out here. We are also experiencing the effects of the biggest drought in the history of our state (all the more reason to use water-friendly square foot gardening methods!). The economy here is based on big oil and I’m not too sure if the ground is safe for growing things due to the contaminants of the oil field that seem to make their way into the ground and air. Do you have any suggestions for me? Can I raise a mostly-above-ground bed using regular garden soil? What would you do? Thanks so much and thanks for writing the book! It’s the equivalent of the discovery of fire for gardeners! I can certainly appreciate your situation, and the SFG system is perfect for you because you don’t have a lot or time or money, but you are interested in gardening. To go quickly to your questions, I would not use your existing soil. I wouldn’t even use it if you lived in Montana or Virginia. The ALL NEW SFG is all above the existing soil. That’s the beauty and the excitement of Square Foot Gardening now. You start with a perfect soil that has nothing to do with where you live and what the ground is like. In addition, SFG takes only 10% of the water that single row gardening uses and it’s easily protected from the heat of the season because it is condensed down to only 20% of the space of a row garden. Do you see some of those big advantages? In addition to all of that, Mel’s Mix holds a lot of water for a long time and if you merely mulch your garden with an inch or two inch layer in the summertime, you won’t have the problem of water evaporating so quickly. If the sun is just too darn hot, you could make a simple and easy sunshade for your boxes. The book is filled with all kinds of tips and hints as to how you can adapt the system to your location. Are you somewhere where you could start a compost pile of your own? It’s easy to collect ingredients, just read that chapter. You could even bring scraps home from the college cafeteria or local restaurants, for example Starbucks gives away coffee grounds to those people that want them for the compost piles. Caution: read the book about that and don’t use too many – but they are free! You can collect shredded paper from many locations and you yourself can be a prime example of someone concerned about the Earth and practice the three R’s – it will make a huge difference in your future. You could even get on social media networks and spread the word about what you’re doing to save the planet, while all those who are just looking in their screens and shooting messages around the world could get excited. Kat, if you were in one of our 3 day symposiums to become a certified teacher we would tell you: You can make a difference and I hope you’ll give that some consideration. Your generation needs more leaders and less internet addicts. I hope you’ll take up this challenge. Please let me know! Mel, I am enjoying your new book. Lots of great information. I started a compost pile and looking forward to getting my SFG going soon. Ants are looking for either food, which shouldn’t be in your compost pile (review the DO NOT ADD items in the book), or they’re looking for a nice location for their nest. As your compost pile heats up, if you keep it moist, that should drive the ants away to another neighborhood. There are a lot of natural remedies to get rid of ants. The best suggestion is to take your question to our forum at http://creatingforum.squarefoot.com and see what has worked for other people. When you do that, mention what state you live in so the answers may be more directed towards your situation. Hope that helps and happy gardening. Do you have suggestions for using SFG in a Community Garden where I have to remove everything and change plots year to year? I read your book and used SFG at our old home, but we are moving this year to another rental and my only option is a community garden plot. I LOVED the SFG method and can’t imagine doing things any other way, but don’t see how to do it this year. I’d have to remove my soil, etc at the end of the season, which seems like too much work and/or paying for someone else to benefit next year! That’s quite a dilemma but I think we can find an answer. First I would go to the powers that be and tell them you want the same location next year. Explain that you’re putting a lot of time, effort and money into a special soil mix and you want to be able to use it year after year. Remind them that every time you harvest a square foot, you’re adding a handful of good compost so that you can use this mix year after year. If, for some reason, they say ‘No, you have to sign up for a new plot in a new location,’ then let’s figure out how you can take your boxes and soil with you. Since you’re not using the existing ground and you’re first laying down a weed fabric, the solution depends a lot on how many boxes you’re going to have. One or two boxes you can just shovel up the soil in containers until next year. An even better idea if you have a lot of boxes would be to pretend that the existing location is similar to a paved patio. You would put plywood bottoms on all of your boxes and at the end of the gardening year, you might just carry those boxes into your storage shed or garage and stack them all up one on top of another. Next spring just move them out to their new location. Since the community garden isn’t open during the winter, there should be no reason why they wouldn’t let you stack all of your boxes in one location for storage. Perhaps after telling them all of this, they might be willing to let you keep a particular spot, especially if you agree to pay a year ahead of time. Also you could volunteer to be a SFG neighbor, answering any questions of other gardeners. Maybe even donating a SFG book to the community library. If that would work, I’ll send you a complimentary copy of the original book and that would get everyone started with the method. You might want to throw your question out to the forum at http://squarefoot.creatingforum.com/ to see if they have some other ideas. Hello Mel – I heard the mix (1/3 compost, 1/3 Vermiculite, 1/3 peat moss) changed to 50% compost, 25% vermiculite, 25% peat moss. Is that true? I guess my first question is, where did you hear that? Somebody always wants to tinker with the formula and in the past we have discussed trying to make the product greener and cheaper with the manufacturer. Since some object to peat moss because it’s non-renewable and vermiculite because it’s expensive, we are testing different formulas all of the time. Since all the nutrients are in the compost and it’s the least expensive and greenest, why not adjust our formula to be 50% compost and ¼ of the other two ingredients? I don’t believe that word has ever gotten out to anyone, so I’m interested in knowing where you heard this. An interesting fact: for overseas or 3rd world countries who can’t afford peat moss or vermiculite, we use 100% homemade compost. It’s not quite as good because it doesn’t have the water capacity and drainage that Mel’s Mix does, but it works well in a 3rd world country. Hope to hear from you soon. I’m very interested in where you heard this formula. These are all great questions and I’m going to touch on them so you feel safe and ready to garden. Regarding the asbestos, people in the garden industry repeat old information thinking they’re being helpful. We even had someone at Home Depot told by the lady clerk that vermiculite is not safe. When we tracked that down specifically, the lady said, “Oh, I don’t know I just heard that somewhere so I thought I’d tell the customer.” If you can find large 4 cubic foot bags of vermiculite, especially if it’s the coarse size, please feel free and safe to buy and add to Mel’s Mix. Concerning the peat moss and sustainability. Peat moss situation comes from the same sort of thinking and talking. We used to get a lot of letters from the UK saying that peat moss is unsustainable. Turns out after we tracked down all those stories that Britain has used up all of their peat moss because they used to burn it. What the burned was called peat and was similar to or a cousin to peat moss, but since they didn’t have a large source of it on their island, it was in danger of being used up and it takes many years to replace. However, when I went to Canada, they said, “Heavens no, we have more peat moss than the world could use in 100 years. Besides that, we’re making more naturally than we’ll ever be able to harvest and sell!” In their mind, there is no shortage, it’s a business and it’s in plentiful supply. Now add to that the SFG answer: we only use it once. The very first time. We add 1/3 peat moss to our Mel’s Mix. Since we’re only adding 6″ deep of Mel’s Mix in every 4×4 box, that’s not very much peat moss. In addition we don’t throw it out and replace it every year. We just add some compost every time we replant – which is renewable. Now remember, SFG takes only 20% of the space of a conventional row garden, so we’re automatically using 1/5th of the amount you’d use in a big row garden – then we only use it once! That’s going to last for well over 10-15 years. Our feeling is that there’s not only not a shortage, but we’re using so LITTLE that we’re kind to the Earth’s supply because it is a naturally occurring material that’s available from the sources all over the world. We’re not depleting it, it’s not in danger of running out, but it is something that could and should be used because of its good qualities. I hope that would take away your feeling of endangering the Earth’s supply when you use it in Mel’s Mix. Concerning the compost and growing in 100% of it: it will work. Not as well as Mel’s Mix because it doesn’t aerate as well, therefore the plant roots can’t breathe as well. It doesn’t hold as much water, therefore needs more frequent waterings, but it packs down more, therefore depriving the plant roots of a perfect environment. All that being said, it is much better than your backyard soil and if it has been properly composted it will not contain any weed seeds. I would definitely recommend getting started with it and especially f you feel comfy using peat moss and finding vermiculite. We use pure compost in 3rd world countries because they don’t have / can’t afford the other 2 ingredients. You don’t have those restrictions, so I think you should go ahead and use more compost. I can’t comment on any particular brand because I’m not local to your source, but I would not buy just one brand even if it says it’s from 5 sources. I would buy as many different brands, but less of each and mix them together for a truly blended compost. I hope that relieves you of all of your concerns and you’ll now be able to start your SFG! I, too, have never read a book so fast! I was describing to my friend how I wanted to build a garden and didn’t know how kit get started. She showed me your book and I could not put it down. I have this thick grass in my yard. So, I really don’t have to dig it out before putting the weed barrier and boxes in? Also, I saw your pyramid boxes and instead of trying to make them myself, (I’m also not industrious) I would love to purchase them from you. Do you know when they might come in for us to purchase? You didn’t mention how many boxes you have and how much area you’re going to use, but I would suggest you lay out your boxes so you know where they’re going to be (make sure it’s a good location and spacing), then set your lawnmower down as low as you can go and mow all the grass that would be inside the boxes as you temporarily move them aside. Then put your boxes back, lay down the weed fabric and fill with Mel’s Mix. The very excellent industrial strength weed fabric we sell on our website, to my knowledge, has never had a weed grow through it. They could grow around it at the edges or corners, so if your fabric sticks out a little on the sides, that would be alright. How’s all that for saving a lot of work? I’m going to check with Tracy in our shop on the pyramid boxes and see when they’re going to be ready. I will also send your email to the shop and make sure they contact you so you’ll be able to order them for your yard. Hope that helps and happy gardening. I have been gardening in containers for a few years out of necessity(we rented and could not dig up yard). I had fairly good success. I even grew summer peas (crowder type) in the openings of concrete blocks filled with soil with amazing success. This year when I was surfing the web for ideas I came across your website. After reading some of the post I remembered that my mom had done something similar many years ago. I called her and she still had your original book, so I borrowed it from her and finished reading it yesterday. I am implimenting many of your methods with some twists. Even though we own our land now the soil is pure red clay. I find your suggestions quite interesting. Especially the spacing of seeds. Now instead of wasting a lot of seeds and overfilling containers (I never thinned) much smarter. I am hoping for great success. I’m also thinking about getting the new book, so I can learn the newer methods. That’s a wonderful story, and maybe you can get your mom to keep Square Foot Gardening. In fact, the two of you could have a little competition there. If you were fairly successful with pots and unusual containers, I would highly recommend you start out with some SFG boxes and the super Mel’s Mix. I would also highly recommend that you do get the ALL NEW SFG book, because it has 10 Major improvements to the old system that you’ll find helpful. The next step is to offer a challenge to your mom and see who can product the best garden with a little friendly family competition. She may also enjoy the ALL NEW book, perhaps as a Mother’s Day present. Good luck with your garden and please send us pictures to askmelsfg@gmail.com if you are interested. Hope that helps and happy gardening. Mel, what is the perfect compost mix.I have all your books ,but cant find it. Thanks for your comment. I recommend a 5 part blended compost as the perfect mix. That means that your compost should come from at least five different sources for the best results. If you are making compost at home and following the proper directions, you should end up with a really high quality compost mix that is just perfect. Check out our Mel’s Mix FAQ on our educational site here: Mel’s Mix. Also, visit the forum at http://creatingforum.squarefoot.com to talk with some other experienced SFGers about how they make their perfect compost mixes. I remember your show when it first came out on PBS I was around 12 years old. I have waited almost 30 years to have a garden big enough where I could try SFG I finally have one. But I’m having a problem finding vermiculite and perlite. I moved to Europe 14 years ago and I can’t seem to find either of them sold in Denmark. I found a few sites on the internet that will ship vermiculite to me but it’s going to be expensive when I add import tax and shipping. Can you think of any alternatives. Denmark gets a lot of rain (and I really mean a lot) I found some pressed coconut shell fiber blocks I was thinking of trying but I’m not sure if that’s just the same as peat moss. The only other thing I can think of to use as a substitute would be sand. My little seed potatoes are all ready to go in to the beds so I need to figure this out soon. You’ve posed quite a problem. The purpose of the vermiculite and the alternative, perlite, is to not only loosed the soil and make it drain well, which sand will do, but also to hold water, which sand will not do. Sand has a tendency to pack down and I would probably stay away from it. I’d keep phoning and googling for vermiculite in your general area but in the mean time I would say that if you’re truly doing SFG, how many boxes do you have and I would consider putting up rain shields like an umbrella for them. They would have to be sturdy so the wind won’t take them away, but that would keep a lot of your garden clear of the excess rain. If you have a lot of boxes and they’re all together, you might think about putting up some sort of a clear plastic “roof” that also would be sturdy against the wind but would keep the rainwater off. You would need the type of framework so that the water won’t puddle and drag the plastic down, althought you can make small holes in each puddle, but that just drains the water into your garden. The best shape would be a peaked rooftop. That’s an odd way of solving your problem but it would certainly help. The coconut fiber blocks can be substituted for peat moss without a problem. I would do it 50/50 if you can, though – 50% peat and 50% coconut fiber. Sometimes we have found a problem with the coconut fibers from being too salty from a lack of washing. The other way would be to think of your winds and rains. If they’re mostly from one direction, then you could possibly put up a clear plastic wall blocking the wind and rain from your boxes rather than a rooftop. If you do any of those, please take pictures and send them so other people that have similar problems can utilize your solution. You might also check out our forum to see if anyone else has some suggestions. Hope that helps. Wow! What an excellent book! I bought in on Monday, read it Tuesday, bought the supplies on Wednesday. I can’t wait to get started this weekend. I was wondering if you had any thoughts on gardening in central or south Florida. I can’t seem to find any books that aren’t oriented towards regions that have frost dates (possible exception is “Vertical Gardening”). I know, I know, it’s a good problem to have. Just hoping for a little more info on shading, plant varieties, planting schedules, etc. Any ideas? Monday, Tuesday, Wednesday. What took you so long?! Just kidding, of course. I want to get you the information you need as quickly as possible because I can see you’re a fast mover. I’ve only gardened in Florida in the wintertime, but I think if you go to our forum, use your exact same letter everyone would love the Monday Tuesday Wednesday story and ask for advice for Florida gardening in the hot weather. I’m also going to send you the email to one of our expert Florida certified SFG teachers, Steve Earls. Here’s the link to our Forum where you should be able to find a lot of great information on gardening in your area. Thanks for your letter and your enthusiasm and please take pictures and keep me up to date on how your garden is doing. We have a big following in Florida, so much so that they might be waiting for you to become a certified teacher/instructor. Have you thought about that after your Monday->Wednesday progress? I never got to read your first book but, now that I have your new book I plan on getting started as soon as possible. Thanks for such a great book and website. Love them both. Thanks very much for your comments and please do send me pictures when you finish your garden. I would love to feature them on the blog. My husband & I are total newbies (and I’m known for bit of brown thumb because of my forgetfullness in watering), but we want to try gardening with our three young children. I am hearing so much good about your method. There was too long a waiting list to get your book from the library, so I am ordering it. In the meantime I’m feeling a little urgency to get going in our short growing season, and we are trying to decide how big to make our garden plot for our first trial year (on a very limited budget). Do you have any specific recommendations for vegetables and herb varieties for a very shady yard in North Dakota? We live in an old neighborhood surrounded by 60 + foot trees, but have been told we should still be able to have some success with growing things like lettuce and peas. I have grown some basil, mint, and rosemary in pots (but had a little trouble with bugs). Thank you so much for any help you can give. The enthusiasm on your blog is giving me courage to give it a try! I was inspired to make some raised beds after many failed attempts of planting a vegetable garden. I notice you recommend the beds be 12″ height. Is there any disadvantage to making the beds 18″ high? We have already built the beds & filled with compost before seeing your blog. I’m also just using string vs a grid. Is their any disadvantage to this? I love this concept of gardening & will be purchasing your book! 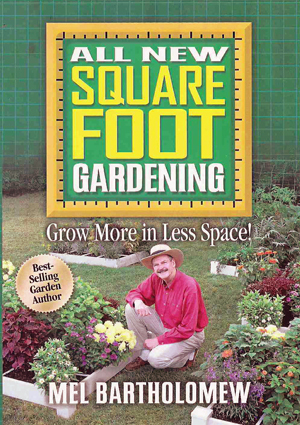 To answer your question with another question, have you read the ALL NEW Square Foot Gardening book? It has all of the updated recommendations and answers all of your questions fully – I would highly recommend picking up a copy! In my original, I recommended digging down 6″ and then building up 6″ of improved soil, for a total of 12″ of improved soil, but I have never recommended a 12″ tall raised bed garden. There is a disadvantage to 18″ tall raised beds – it costs 3x as much as a 6″ raised bed and you don’t need the extra inches! If you have already built it, I would put 12″ of sand, add a weed cloth and then add 6″ of Mel’s Mix on top. As far as the string vs. a grid, in my original book I recommended string but no longer do so. In the new book I cover all of the disadvantages like rotting, breaking, dirty, saggy and hassle. Also, rusty nails to spool the string around. In addition, if you use string you won’t be able to enter our new contests and win $300! Good luck with your garden and I hope you make these changes to reflect the new SFG method. This is my first comment on your blog. I come to know about your blog by my one question on Hobby Farm. They have suggested me to visit Square Foot Gardening website. And, I’m too much happy to visit your website. I’m quite eager to buy this book and added it to my wishlist. In India, your book’s price is Rs. 851 on Flipkart. Can I buy this book from another source? Great that you have come across our website and are gardening! There must be other bookstores for you to buy from that are cheaper? My suggestion would be to purchase the eBook off of Amazon for $9.99, which I understand is 557 rupees. I hope that helps. Yes, you can build a Square Foot Garden with raised legs so that it reaches up to your arms for easy wheelchair access. That’s the beautiful part about Square Foot Gardening – it can be used for anyone and everyone. If I put the weed cloth on top of the ground after removing the grass and weeds, and then my square foot garden on top of it, won’t it eventually let weeds come through? And then won’t I have to start all over again? If I used cardboard on top of the ground under the weed cloth would that help? My husband wants to use large, hard plastic trays on top of the ground and drill holes in it to let the water drain, put the weed cloth on top of that and bricks around the sides to hold the dirt in. He doesn’t want the bottom to deteriorate so that we have to start over when the bottom breaks down and the weeds come back through. Is that a good idea or not? Next, I don’t quite understand the idea of the plastic trays. You don’t really need that. We have many gardens and gardeners in Florida who just follow putting down a weed fabric, put a box on top of that, fill it with Mel’s Mix, add a grid (which is extremely important for success) and start planting. The water will be held in the Mel’s Mix–it’s a special made mix for that purpose–yet it will drain out the bottom when theres too much water so the plants can still breathe without being in a swimming pool. I think you can save yourself a lot of work by not using the trays. One other thought for you: start small. Don’t put in a whole bunch of boxes. Start with just a couple the first season. Buy either pre-fab boxes or build your own, follow the book. Buy all the ingredients for Mel’s Mix from stores or the pre-made mix. Call ahead to stores to see if they have mix ingredients or the pre-bagged SFG mix. Spend the first season just getting used to the simplicity and ease of the SFG garden. If all goes well, you can add more boxes next season and you’ll find a much better way to get started. Where would I buy the kind of vinyl that could be used to make a square foot gardening box? How long would a box made from the vinyl last and how long would a box made from wood last? I don’t think my husband wants to have to make new boxes every year. Good news for your husband. Unless you make that amount of cardboard, all boxes will last several years depending on the material used. The life of a wood box depends on what kind of wood you use. The more expensive ones will last longer, obviously. That would be redwood and cypress. Next down the line would be pine and fir. Those cheaper woods would last 3 to 5 years unless you have termites, then 1 to 2 years. The lumber companies can tell you better for your local conditions in Florida how long each type of wood would last and how much each would cost. The good news is at the same lumber companies, you can buy vinyl fencing that also comes in 2×6 sizes and they’re easy to cut to length. They would even cut either the wood or the vinyl at the big box stores, usually free. The difficulty with the vinyl fencing is it’s difficult to connect at the corners because the panels are hollow. If you go on our website for the boxes (http://www.squarefootgardening.com/garden-planters/), you will see we have special corners made that are cut out so the panels can slide right in and lock. Last step is to put a cap on them so they look nice. The vinyl costs a lot more than the wood, but should last 10-20 years. It won’t rot and termites won’t bother it. If I may suggest it, the best choice for your husband would be to buy a pre-made ready-to-assemble kit from our website and all of the proceeds will go to our educational and humanitarian projects around the country (http://www.squarefootgardening.com/garden-planters/raised-bed-garden-box-post-corner/). Both the vinyl and the wood boxes we have for sale are so easy to put together that a 4 year old can do it. You won’t even have to have your husband do any work. I hope that helps you make a selection. If you’re going to go to the store, make sure you buy material for a grid. The wood grid can be made out of a 4 foot long lath or screen door molding cut to the size of your box. Drill holes at each intersection and secure with nuts or bolts. All is very simple and easy to do. By the way, all of our boxes come complete with weed fabric at the bottom, a necessity in Florida, and the grid all ready to snap together (http://www.squarefootgardening.com/garden-accessories/do-it-yourself-kit-wood-grid-weed-fabric-4×4/). Hope that helps and you’ll be able to get your garden started soon. If you have any questions, please call our store telephone number for detailed help (803)397-2816) with our products if you are buying them. And i’m glad reading your article. But should remark on some general things, The website style is ideal, the articles is really nice : D.
Thank you for your comments and I’m glad that you like the articles. Have you considered starting a fall garden? Keep an eye out for more information on fall gardening coming soon on our SFG Foundation’s website at http://www.squarefootgardening.org site. We’ll be posting some helpful information and tips for your fall garden.